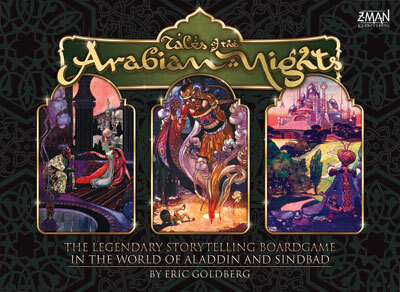 In this new edition of the groundbreaking storytelling game, you enter the lands of the Arabian Nights alongside Sindbad, Ali Baba, and the other legendary heroes of the tales. Travel the world encountering imprisoned princesses, powerful `efreets, evil viziers, and such marvels as the Magnetic Mountain and the fabled Elephant`s Graveyard. Choose your actions carefully and the skills you possess will reward you: become beloved, wealthy, mighty - even become sultan of a great land. Choose foolishly, however, and become a beggar, or be cursed with a beast`s form or become insane from terror! YOU will bring to life the stories of the inestimable Book of Tales in this vastly replayable board game with over 2002 tales that will challenge, amuse, astound and spellbind you for years to come.